In the morning our representative meets you with a signage at the cruise exit door at Aqaba Port (inside the port area). 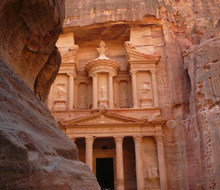 You drive 2 hours to the rose red rock city Petra, a must-see in the Middle East. Upon arrival at the Visitor's Centre start on horse back or on foot to the Siq, a narrow gorge, and continue to the beautiful Treasury. From here walk along the Street of Facades and if time permits to the Royal Tombs and Qasr Al Bint. Walk the same way back to the entrance gate. After buffet lunch drive back to the cruise in Aqaba. Duration Ca 8 hrs. 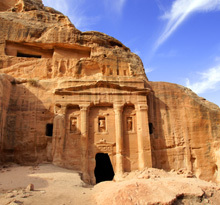 ● English speaking spot guide in Petra (2.5 hours). 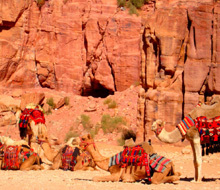 ● The tour requires considerable walking in Petra, the number of horses is limited.